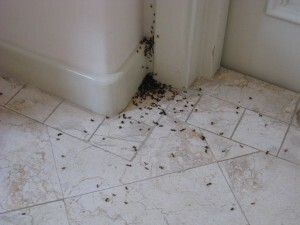 Is your kitchen or bathroom being overrun by ants? These little critters are tough to get rid of and can quickly turn a nice summer afternoon into an all out war trying to get your ant problem under control. Stop wasting money on products that you buy from the big box stores and call Eco Tech, an experienced New Brighton, MN ant exterminator. While ants may be interesting to look at from afar, they’re not fun to deal with when they’re taking over your home without a formal invite. For every one human in the world there are roughly 1 million ants. Certain ants can support up to 100x their weight, even while upside down. The largest ant colony ever found was 3750 miles long and was causing a major problem for crops and local animals in Europe. Some ants have been reported to live up to 30 years. There are over 12,000 different species of ants. Fire ants cause an estimated $5 billion dollars worth of damage in the US each year. Ants have 2 stomachs, one for their food, and another to feed others. Now that you’ve had your lesson on ants for the day it’s time to get back to the task at hand – getting rid of the ants in your home! When you realize you have an ant problem, you have a number of different options in terms of pest control. You can choose to purchase products from a local hardware store or you can choose to hire an ant exterminator to take care of the problem once and for all. While products from a hardware store may slow down an ant colony in or around your home, they likely will not get rid of your problem once and for all. Therefore, it’s best to call an effective ant control company, but who should you call? At Eco Tech we have decades of pest control experience in the New Brighton, MN area. Not only will we get rid of your ant problem, but we’ll also use less toxic, organic products. These organic pest control products will be just as effective as more harmful chemicals, but you won’t have to worry about these products harming your pets or family members. For more information about Eco Tech’s wide array of pest control services give us a call today at 763-785-1414.